Vivaldi Gloria and works by living composers in association with Firehead Editions. 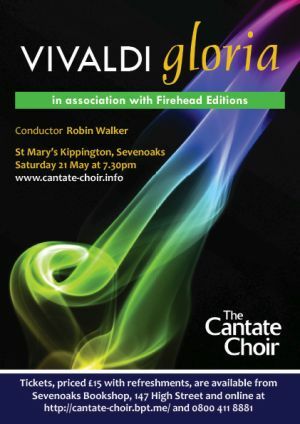 The Cantate Choir will be performing Vivaldi’s Gloria in May. Written in around 1715 it is a joyous, sparkling piece for choir and soloists, with distinctive, sunny harmonies and beautifully expressive moments. This lovely, uplifting music forms the centrepiece of our concert. Following our tradition of presenting new music, we will also be performing a selection of pieces from Firehead Editions. This is a collective of three contemporary composers: Frederick Frahm, Huw Morgan and Nicholas Wibberley. They have written music for a wide variety of different contexts and are all distinguished composers, conductors and performers. Their music is intelligent, well-considered and attractive, and is performed the world over. We are delighted to be presenting a selection of their recent works, both sacred and secular, which we are sure you will enjoy. We look forward to welcoming you to an inspiring evening of old and new music. Tickets are £15 and will be available at Sevenoaks Bookshop or online and by phone from Brown Paper Tickets and 0800 411 8881. They will also available from members of the choir. You can register to receive e-mail updates from the home page of this website.